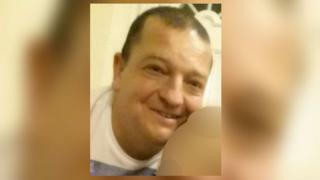 A binman who was killed by a dustcart was a father-of-three and a "hardworking family man". Steve Bishop, 37, died following a collision in Osea Way, Chelmsford, at about 09:05 GMT on Friday. In a statement issued via Essex Police, his partner Nickie said: "Words will never express how much he will be missed. "Steve always put others first. He never failed to help anyone. He was the life and soul of the party." She said he was a "wonderful fiance, father, son and friend to us all". "Our home is empty without him. He was a true happy, hardworking family man with a heart of gold," the statement added. "His life will go on within our three young boys. Goodnight my beautiful angel." The Health and Safety Executive said it was was working with police to investigate the death.